As Cinqo de Mayo approached there was a lot of talk about pozole. I couldn’t recall hearing about the pre-Columbian Mexican soup prior to this year and it captured my interest. 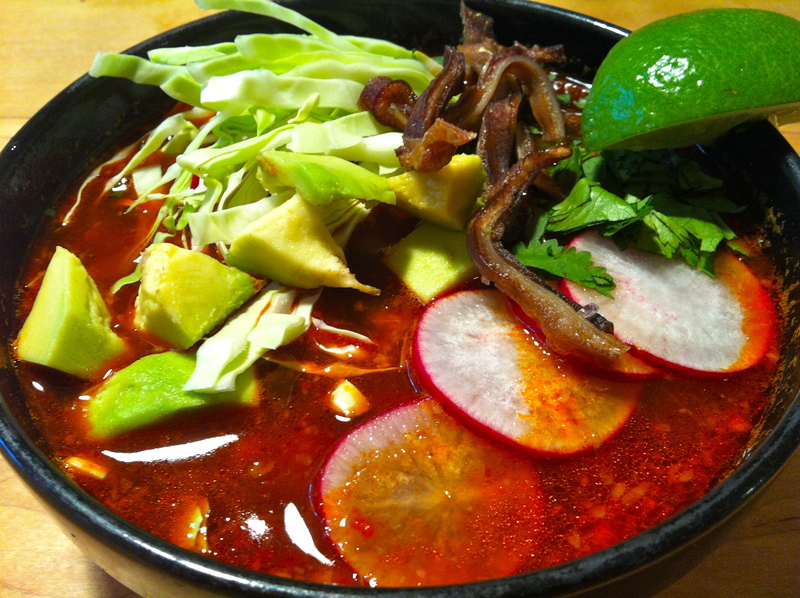 There are several different versions of pozole, but the most intriguing was pozole rojo, made with hominy, chillies and, usually, pork. I didn’t make it to the Honolulu’s Cinqo de Mayo celebration to try Zaratez‘ take on pozole, but hit up Serg’s, a place near my house that makes some really good tacos. For Cindqo de Mayo they offered a pozole verde, which was greasy, salty, and a huge disappointment. It became clear to me that I would have to take matters into my own hands. Mercado De La Raza is the only Mexican grocery that I know of on island and was naturally my first stop for ingredients. I picked up dried chilies, some really funky purple corn, and cal (calcium hydroxide). The total was only $4! I went to my usual purveyor of pig in Chinatown and picked up half of a head. The butcher lady was a little put off by my wanting an half of a head instead of my usual jowl. Her confusion and the language barrier led to me getting a boneless half head, but it didn’t end up affecting the outcome. The party started with sautéing 1/2 of the onion in a big, heavy pot, then throwing in the carrot, celery, and a few cloves of garlic before adding the head, pork stock, and water. I added cumin, salt, and pepper, brought everything to a boil and let it simmer for about 5 hours, periodically skimming the surface. Once everything was under control with the soup, I moved on to the hominy. 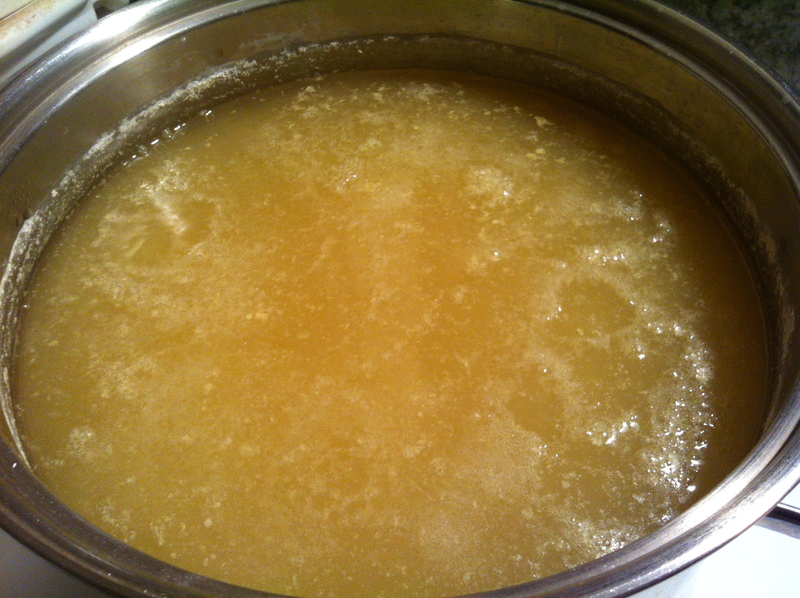 I filled another big, heavy pot with water, added the corn and the cal, and brought it to a boil. I let it simmer for about 3 hours, then shut off the heat and left it on the stove overnight. The pot of corn turned a vivid gold. After about 5 hours, I removed the soup from the heat, strained the liquid, pulled apart the head meat, then refrigerated both overnight. Walking the snout to tail walk. The next day, I skimmed off the fat from the surface of the now congealed broth (which was surprisingly very little) and brought it back to a boil. 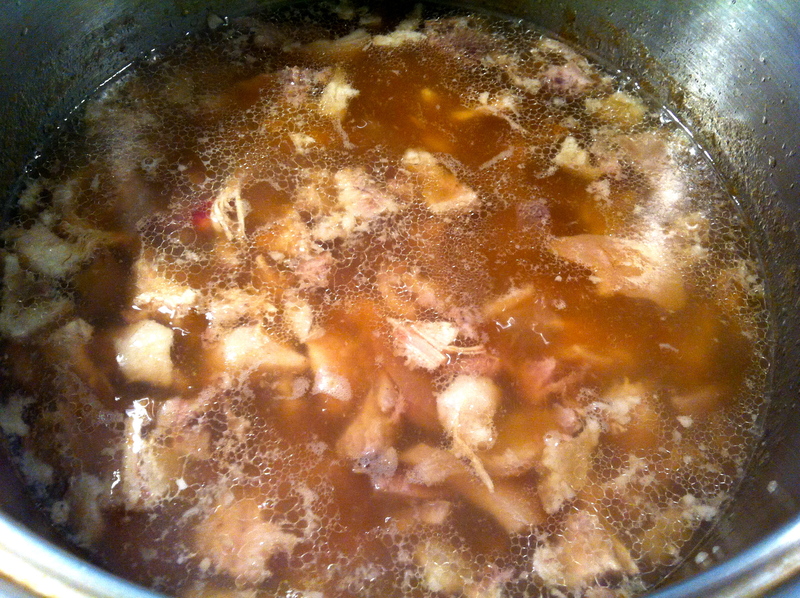 Next, I chopped the gelatinous chunk of meat into manageable pieces and added them to the broth. 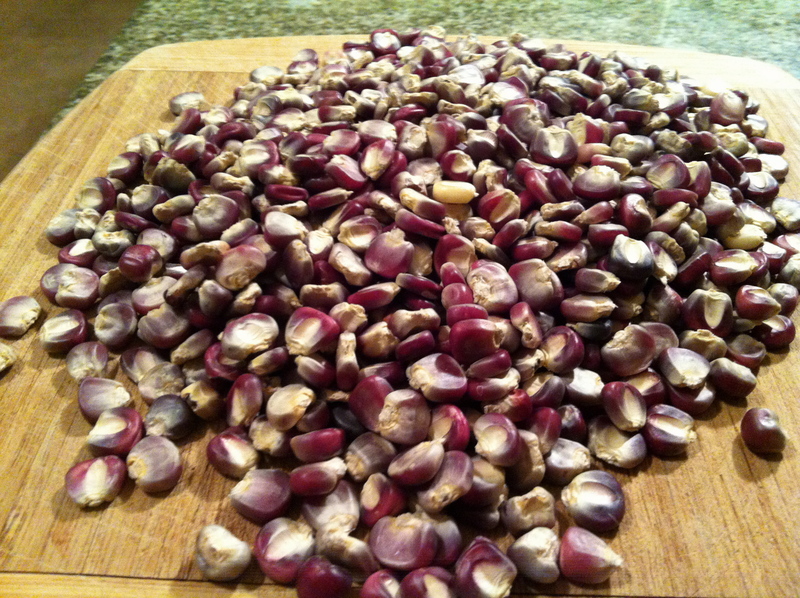 I drained the corn and rinsed it several times to be sure to remove all traces of the cal, then added it to the soup. 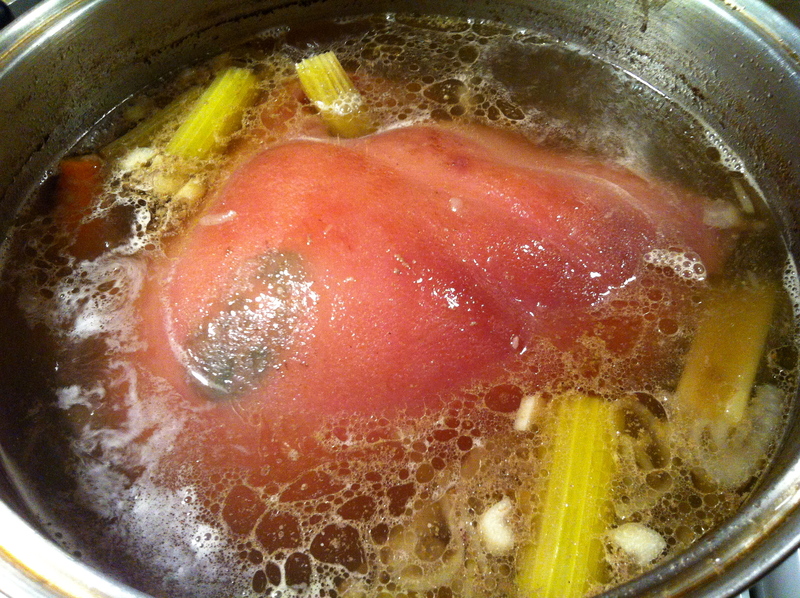 Prior to cooking the head, I removed the ear and set it aside. At this time, I put the ear in a small pan with water and brought it to a boil. I dumped out the scummy water, replaced it with fresh water and returned the ear to a boil. I added cumin, chili powder, salt and pepper, then simmered the ear for about 2.5 hours. While this was going on, I toasted my chilies, then sauteed the other half onion and garlic in the fat I scraped off from the top of the broth. I removed the ear from the pan and used the liquid to rehydrate the chilies, which took about 30 minutes. 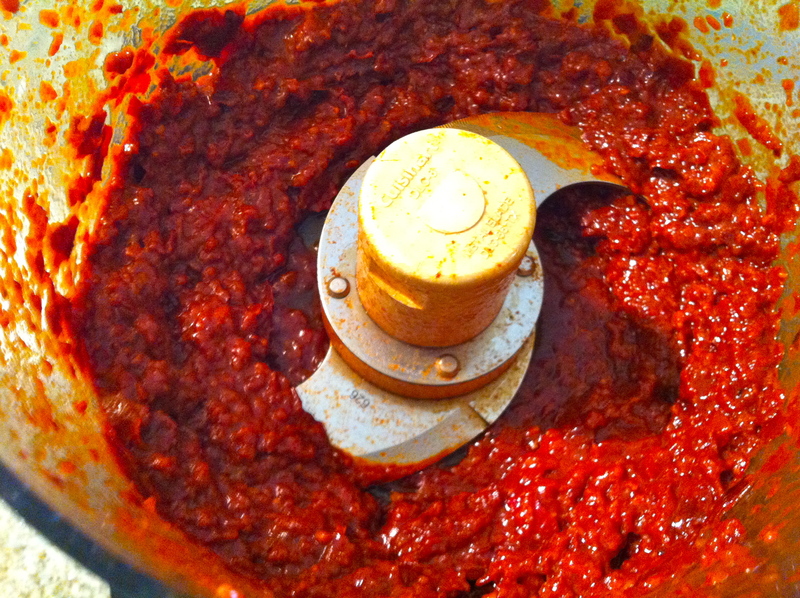 I put the chillies, onion, and garlic into the food processor with a little of the rehydrating liquid and pulsed it into a paste. 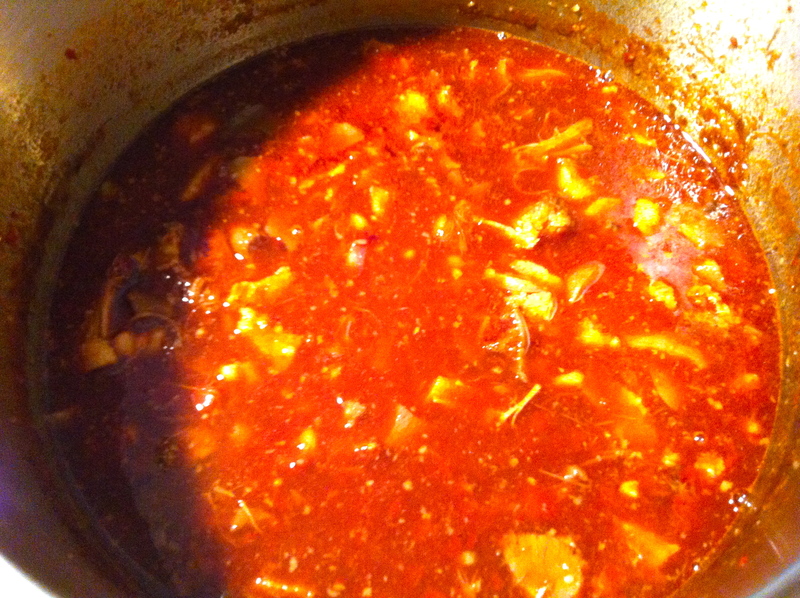 I added the chili paste to the soup and let it simmer for a few hours. That was pretty much it for the soup. I cut the ear into thin strips, sprinkled them with sea salt and put them under the broiler. For garnish I went with the ear, avocado, radish, cabbage, cilantro, and lime. The slices of ear lost their crispiness once they met the broth and will not be including in future pozole endeavors. I also forget Mexican oregano when I was at the market and will be including it next time around. The broth was really good, full of porky richness and a nice amount of heat. The meat was tender, pieces of skin like butter, and the hominy very bean-like. There are relatively few ingredients involved and the only solids in the soup itself are pork and hominy. The garnishes provided interesting textures and, with the exception of the not-so-crispy crispy pig ear, everything in the bowl got along swimmingly. I’m my own harshest critic and was very pleased with the outcome. I have a new favorite soup! Quite the process mate. 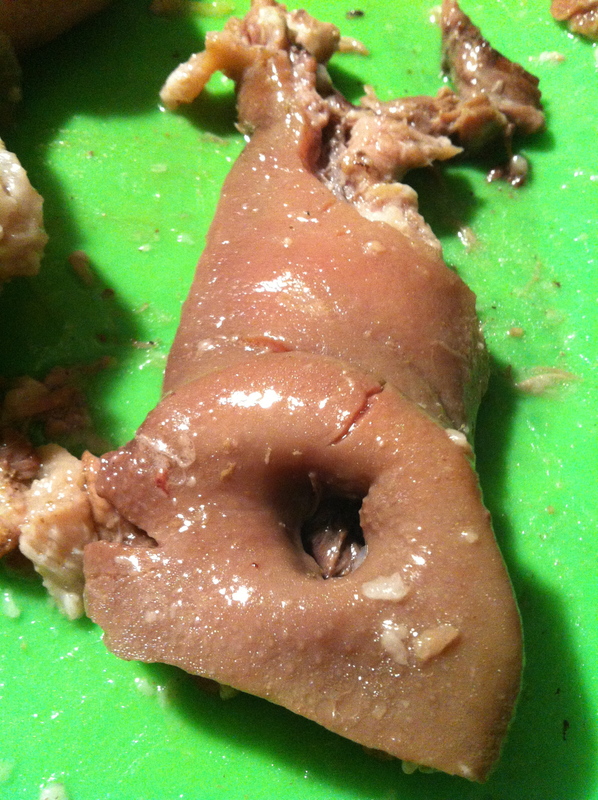 I had this in Mexico and didn’t know there was a pig’s head involved until I went to fetch my second helping. The first serving was plated for me. I opened the pot and to my surprise there was a floating pig’s head smiling back at me. Pretty robust pork flavor in it and I did have at least two servings; I’d eat it again any day. Interesting read on how to make it. Cheers brother. A LOT of work, but a great result! My nail tech has *her* coconut man in Chinatown! She gets the young ones, cuts off the tops, drinks the water and eats the soft flesh.- knife skills! Looks delicious! I grew up in Southern California and a family friend made this for the children’s birthday parties. (Which were often; there were five kids.) I would recommend serving it with tostada shells, and using it to scoop up bites. It brings a nice crunch and you can control the size better with those than tortilla chips.